Sterling values the feedback from our customers. When maintenance personnel required easier access to the spray/tray type deaerator internals, Sterling improved the design. The water distribution system design now utilized by Sterling is a header-style spray pipe with spray valves installed throughout the pipes. Utilizing the header-style spray system allows more room for maintenance to access the spray valves and vent condenser. 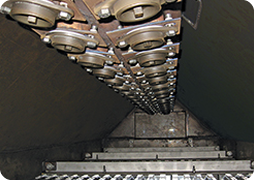 Some older vent condenser designs proliferated high thermal stresses in the vent pipes and their connections to the waterbox causing vent pipes to crack or loosen at the weld joint. Sterling’s header style design has eliminated this problem and also allows easy access to the vent pipe for inspection. The header style design removes the vent pipe from the water box and allows the vent to be further removed from thermal stress, thus decreasing wear. The header-style spray pipe offers several more advantages besides those for maintenance. One important advantage is the position of the spray valves. Sterling designs the spray pattern for the most efficient deaeration by graphically laying out the spray valves for each deaerator. 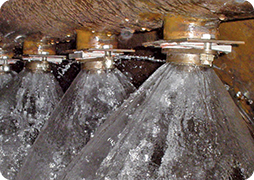 The position of the valves underneath the header also prevents valve chatter during low flows because water flows parallel to the spray valve axis. Sterling has also improved the spray valve mounting system. The spray valves are mounted with bolts rather than studs. Previously, when stainless steel studs had their threads stripped or damaged, replacement was difficult and time-consuming. Once again, Sterling listened to customer input and changed the design. Now maintenance personnel can quickly and easily replace a bolt rather than cutting and welding on a new stud. Continuously seeking to improve our product, Sterling has ongoing Research and Development efforts which have led to improvements in reliability and efficiency and have resulted in issuance of patents. Commitment to maintaining a focus on the latest technology is Sterling’s pledge to its customers. Our highly skilled engineering staff continues to search for new and more efficient designs, which will secure Sterling’s place as a world leader in deaeration equipment. 2014 Sterling Deaerator Company. All rights reserved.